SUV Shopping? Take a look at this 2011 Jeep Wrangler Unlimited for sale Greater Kansas City area! 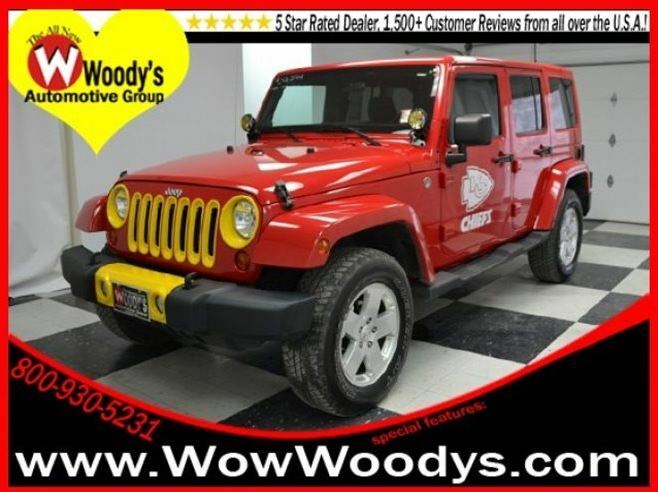 2011 Jeep Wrangler Unlimited Kansas City Chiefs edition CD Stereo w/Auxiliary. 4X4! Come to the experts! Here at Woody’s Automotive Group, we try to make the purchase process as easy and hassle free as possible. We encourage you to experience this for yourself when you come to look at this good-looking *2011 Jeep Wrangler*. Life is full of disappointments, but at least this fantastic Wrangler will always be there for you and never let you down.